Item Number: 270-4-412 17170 Actual Weight: 18 lbs. 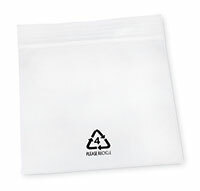 Features recycle logo with "Please Recycle" printed at bottom of bag. Side-welded polyethylene bags meet Walmart's poly bag guidelines and FDA and USDA specifications for food contact.